Vladimir Ruzicic - Kebac, born 2.10.1978 in Valjevo. At the beginning of high school (1993) he started playing drums with young bands who were inspired with the success of Neverne Bebe. ...He practiced their songs together with his friends and also recorded all their TV shows in that time. During that time,he started a great friendship with Goran Marinkovic who was their drummer back then, and with whom he was working on perfecting his drumming on a daily basis. However, the greatest turn in his lasting carrier happened when he was admitted in class of professor Miroslav Karlovic, our finest percussion teacher. Friendship with Goran caused him to work as a drum-tech with the band, despite his many obligations. That is when he personally met all band members and travelled with them for about a year. This was in the 1998 on a promo tour for a second album of Neverne Bebe. Later on , he played with band which was their substitute in the greatest music TV show named "3K-DUR".Afterwards, he gets many calls from bands in Belgrade thanks to that engagement. Meanwhile, he became a studio musician, doing recordings for great instrumentalists (Bane Jelic) and many other artists (Igor Tasovac,Ivana Jordan). 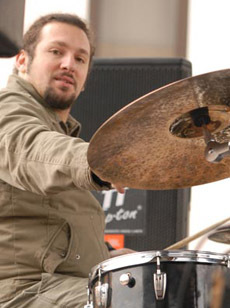 He also becomes an official promoter of Turkish Bosphorus cymbals for Serbia. At the end of 2003, he joins an ethno-jazz band "Ognjen i Prijatelji", with whom was he records a CD and travels around Europe by playing on various festivals. After this, he gets a invitation to play percussions with N.Bebe on The best of tour. At the same time performs with the biggest ethno group Balkanika and records a DVD concert on Kalemegdan (Belgrade). Since 2005 he is a permanent member of Neverne Bebe and participates in recording of new album "N'Bebe V - iza oblaka". Kebac is married and has a son. Bands which, next to N.Bebe, had influence on his evolution as a musician are: The Beatles, Uriah Heep, Deep Purple, Led Zeppelin, Smak, B. Dugme, Metalica, Iron Maiden, Whitesnake, Van Halen, Europe, EKV, Dream Theater, Toto, Los Lobotomys, Peter Gabriel, Chic Corea Electric Band, Genesis, Richard Bona, Joe Zawinul, Pat Metheney group. Famous drummers as idols: Billy Cobham, Steve Gadd, Simon Phillips, Ian Paice, John Bohnam, Dave Weckl, Antonio Sanchez, Phil Collins, Jeff Porcaro, Manu Katche, Mike Mangini, Buddy Rich. Kebac's gear at the moment : Drumworkshop Collectors series ( dw ), Bosphorus cymbals, Remo drumheads, Vic Firth drumsticks.